Membranes organize proteins and other molecules enabling the cell to run much more efficiently than if everything were floating freely. Mitochondrial membranes, for example, keep protein assembly lines together for efficient energy production. And the lysosome safely holds enzymes that would destroy essential proteins if released into the cytoplasm. Membrane-enclosed vesicles form packages for cargo so that they may quickly and efficiently reach their destinations. In this way, membranes divide the cell into specialized compartments, each carrying out a specific function inside the cell. Phospholipids provide the framework for all membranes in the cell. Phospholipids are made up of a phosphate head region and a lipid tail region. The two ends of a phospholipid have very different chemical properties. The head end is attracted to water, while the tail end moves away from water. When phospholipids are placed into water, they organize themselves into a structure called a bilayer. The water-fearing tail regions clump together on the inside of the bilayer, as far from water as possible. The head regions move toward the outside of the bilayer where they contact the surrounding water molecules. The shape and chemical nature of phospholipids drives them to organize themselves one level further. 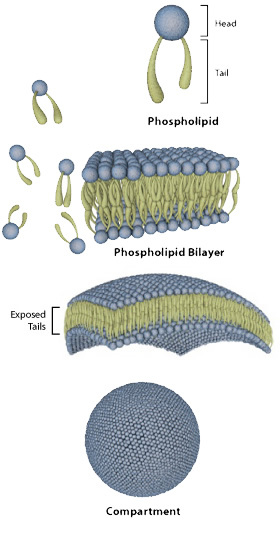 A flat phospholipid bilayer leaves the edges of the tails exposed to water. By forming into a sphere, all of the tail regions are protected inside the bilayer as far from water as possible. The result is a membrane-enclosed compartment. Phospholipid membranes form a barrier that most molecules cannot cross. But living things need to be able to interact with the outside world. At the very least, waste must be able to go out and raw materials need to come in. That&apos;s where membrane proteins come in. Membrane proteins that contact the spaces on both sides of the membrane are the gate keepers of cellular compartments. Each type of compartment has a specific population of membrane proteins that largely define its function. On average, proteins make up about half the mass of membranes. 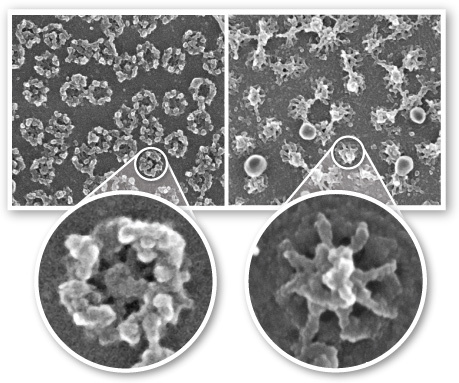 The nuclear pore complex (see scanning electron micrographs at right) is a unique protein structure that controls traffic flow in and out of the nucleus. Each nuclear pore complex is made up of hundreds of individual proteins. Nuclear pore complexes on the nuclear membranes of frog oocytes as seen from the cytoplasm (left) and from inside the nucleus (right). Images courtesy Dr. Martin W. Goldberg, School of Biological and Biomedical Sciences, Durham University, UK. Membrane proteins represent a large number of proteins with diverse functions. Phospholipids with their embedded proteins form a dynamic, fluid environment. Individual proteins and phospholipids flow freely. Complexes of proteins and specific subtypes of phospholipids form "rafts" that move through the membrane. Organelles stretch and bend and even flow through the cell. Fluid membranes allow cells to be dynamic and responsive to their environment. Active membranes in fish skin cells migrate across a culture dish. The shift in focus about halfway through the sequence reveals nuclei, lysosomes and elongated mitochondria inside the cells.Video courtesy Dr. Mark Cooper, Associate Professor, Department of Zoology, University of Washington. Genetic Science Learning Center. 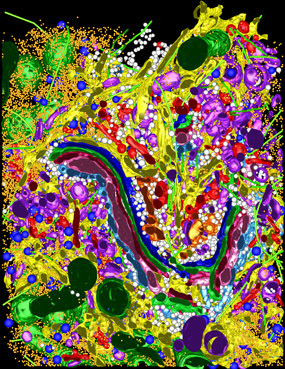 "Membranes Organize Cellular Complexity." Learn.Genetics. September 2, 2010. Accessed April 18, 2019. https://learn.genetics.utah.edu/content/cells/membranes/.